Brainwavz strives for 'audiophile grade' sound with flagship B400 buds | What Hi-Fi? The Hong Kong-based headphone company celebrates its tenth birthday with the UK launch of its most expensive in-ears to date. The B400 quad balanced armature in-ears, which follow the UK launch of the B200 model last June, are available today from $190 (£145, with free international delivery). 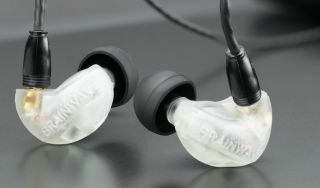 Since its foundation in 2008, Brainwavz has strived to offer 'audiophile grade' sound for affordable prices. And with the B400s, it aims to deliver that promise through four customised Knowles drivers and 3D-printed, hand-assembled housing. Available in eight colours, including blue, pink, green and 'frosty' (pictured), the B400s are boxed with both 3.5mm and 2.5mm cables, several pairs of silicone tips and a carrying case. On the face of it, the B400s may look worthy of a three-figure price tag, but for now the jury is out on whether they stand up to the sonic benchmark set by the Award-winning Shure SE425s.